Use the Employee Reinstatement Notice Letter to notify an employee that they are being reinstated to a previous position and benefits. This Employee Reinstatement Notice Letter is included in editable Word format that can be customized in Word or by using the included Wizard software. How do you write a Employee Reinstatement Notice Letter document? To: First Last, Contract Job Title. This is a notice from the company that, effective Start Date, you will be reinstated to your former position at Company Name. Your salary and your benefits will be identical to your salary and benefits before you left the company. If you have any questions, please contact the Human Resources Manager. 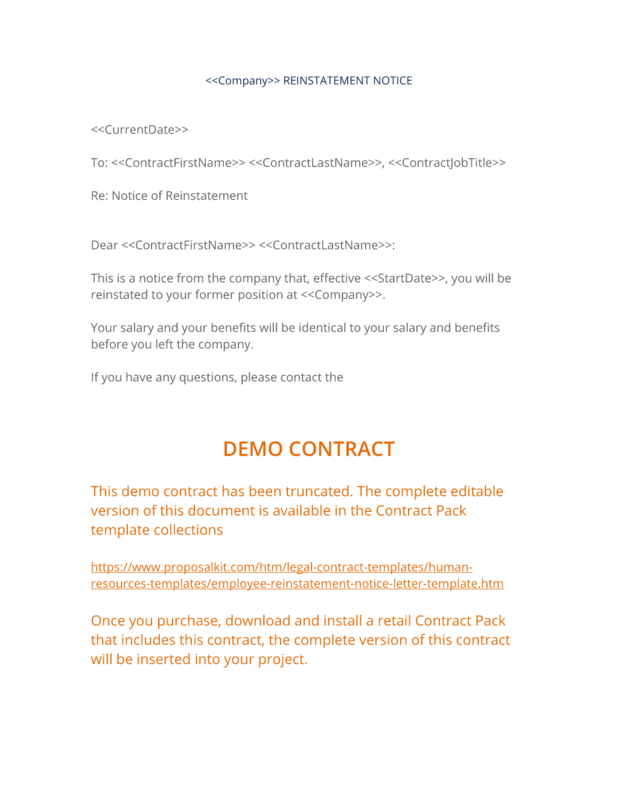 The complete Employee Reinstatement Notice Letter - with the actual formatting and layout - is available in this Contract Pack.